Barber's uninspired Liberty Head nickel had been in production since 1883. Under the Coinage Act of 1890, a change in the its design was permitted after 25 years. Secretary of the Treasury Franklin MacVeagh, originally a Roosevelt appointee, wasn't about to pass up the opportunity. Reminded by his son in May, 1911 that a new nickel would be "A permanent souvenir of the most attractive sort," MacVeagh, pointedly bypassing the competent but mediocre Barber, started the process for a new design. James Earle Fraser, a former assistant to Saint-Gaudens and a prolific artist best known for his monumental "End of the Trail" Indian sculpture, created a truly unique design for the new coin. Up until that time, except for Bela Lyon Pratt's quarter and half eagle of 1908, the "Indians" portrayed on U.S. coins were primarily Caucasian with an Indian headress, epitomized by Saint Gauden's Greek Nike head on the 1907 Indian eagle. Fraser's design accurately portrays a male Native American, and the obverse portrait was a composite of three chiefs who had posed for him years earlier. Keeping with the distinctly American theme, he depicted an American bison on the reverse. The inscriptions UNITED STATES OF AMERICA and E PLURIBUS UNUM are artfully placed over the buffalo, with the denomination FIVE CENTS below. The legend LIBERTY and the date are similarly well executed on the coin's obverse. Fraser's design was medallic and beautiful, and for that reason was favored by Secretary MacVeagh. Its allure seemed to completely elude Barber, who complained that the design elements were too large and didn't allow for the proper placement of inscriptions. Barber didn't get very far with this, as the design remained unchanged over his objections. Reservations also came from the vending machine industry, whose devices were designed primarily for accepting cents and nickels. Particularly persistent was the Hobbs Manufacturing Company, which marketed a machine for detecting counterfeit coins. Mr. Hobbs was certain that Fraser's design would not work in his mechanism, and he asked that significant changes be made to the models. After much wrangling over this, Secretary MacVeagh instructed the Mint to proceed with the original design and let the vending machine companies adapt their mechanisms to the coin. Over 1.2 billion Buffalo Nickels were minted from 1913 through 1938 at three mints; Philadelphia (no mintmark), San Francisco (S), and Denver (D). The mintmark can be found on the reverse under the denomination, while the designer's initial "F" is below the date. There were two varieties made. Type 1 nickels, minted only during the first few months of 1913, had the denomination FIVE CENTS on a raised mound. As early as April, rapid wear in this area became evident on the coins in circulation, so Barber finally got his chance to modify Fraser's design. He cut away the mound, creating an exergue into which the denomination was set. This solved the reverse wear problem, but then he kept going. He smoothed out much of the detail and granularity in both the Indian's portrait and the bison's hide. The resulting Type 2, however, lacked much of the artistic impact of the original. When grading these coins of this type, you must take the surface into account, as many full luster pieces will not show rounded relief detail on the high points of the horn or the fringe on the tail. Generally, the date and LIBERTY will be faint on weakly struck pieces. The points on the coin that wear most readily are the high point of the Indian's cheekbone and the hair near the part. On the reverse, the bison's hip, the fringe on its tail and the horn are the first areas to show wear. Collectors of this series have a fascinating array of "tough" dates and rarities to pursue. The most difficult coin to obtain is the very rare 1918/7-D overdate. Another overdate exists for both the Philadelphia and San Francisco Mints-the elusive 1914/3. Scarce to rare dates in high grade include all the San Francisco coins from 1913 through 1928, with 1918, 1920 and 1924 through 1927 being the rarest. Denver coins are usually weaker strikes than San Francisco pieces. They present the collector with challenges like the 1918 through 1920 issues and the 1925 and 1926 coins, along with the famous 1937-D 3-legged Buffalo. This extremely popular variety (caused by excessive die-polishing to remove clash-marks) was not discovered until most of the coins had reached circulation, making well-struck gem specimens very rare today. Particularly in the case of the "3-legger" or the overdates, authentication by experts is advised, as many counterfeits exist. Recent years have witnessed renewed collector interest in the Buffalo series, no doubt stimulated by the wealth of new research published by nickel specialists. An ever-growing number of numismatists are assembling complete sets of Buffaloes by date and mintmark. Demand is also strong from type collectors, all of whom seek this design for their 20th Century-or more comprehensive-type sets. Although well struck, inexpensive type examples such as 1938-D are available, many collectors prefer to pursue one of the scarcer dates. 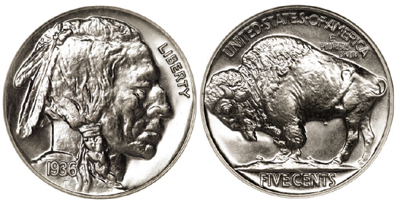 By the end of 1937 planning for the Buffalo nickel's successor was well under way, as the design's required 25 years would end the following year. It was to be replaced by the third coin to bear a likeness of one of our presidents, Thomas Jefferson. The Jefferson nickel continues in production to this day. BIBLIOGRAPHY: Breen, Walter, Walter Breen's Complete Encyclopedia of U.S. and Colonial Coins, F.C.I.Press/Doubleday, New York, 1988. Cohen, Annette R., and Druley, Ray M., The Buffalo Nickel, Potomac Enterprises, Arlington, VA, 1979. Lange, David W., The Complete Guide to Buffalo Nickels, DLRC Press, Virginia Beach, VA, 1992. Vermeule, Cornelius, Numismatic Art in America, The Belknap Press of Harvard University Press, Cambridge, MA, 1971. Wescott, Michael, with Keck, Kendall, The United States Nickel Five-Cent Piece, Bowers and Merena Galleries, Wolfeboro, NH, 1991.